These Billet Aluminum Door Sills by RECON are the perfect addition to your Ford truck. 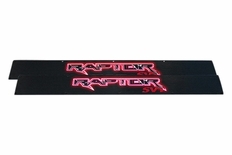 Featuring EL (electroluminescent) lighting, these kick plates will light up the word "Raptor", just as you see in the photos above. 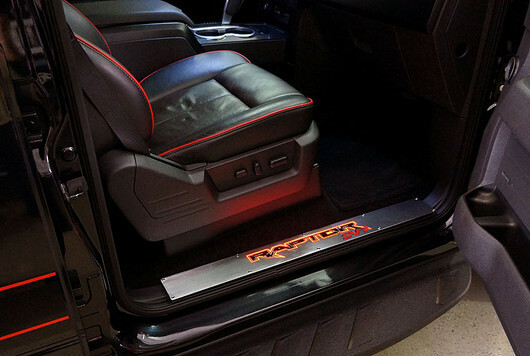 By tapping into your vehicle's existing wiring, these kick plates will automatically light up when you open your door and then turn off as soon as you close the door. Their Black finish is anodized, so it won't chip peel or fade. The part number for this item is 264421FDBKRD and it fits 2009-2014 Ford F150 models. The price is for a PAIR. 1 for the front driver and 1 for the front passenger door.